An example of River Bottom Productions’ industrial work. Joshua Barnd is the owner and operator of River Bottom Productions, a Jordan, MN-based production company that has provided multifaceted production services to the greater Twin Cities area since 2008. 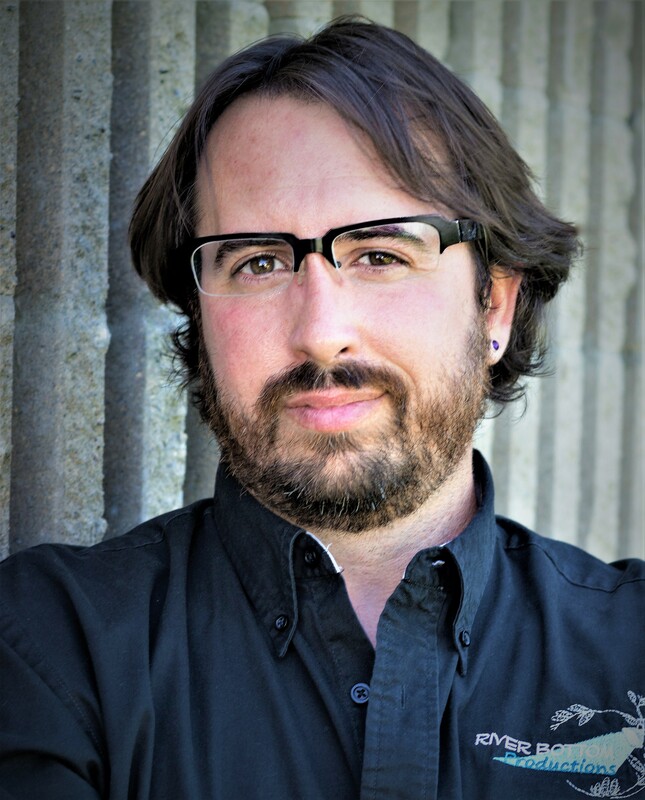 On any given day, Joshua might be working on scenic design, lighting, sound, prop building, or DJ services. 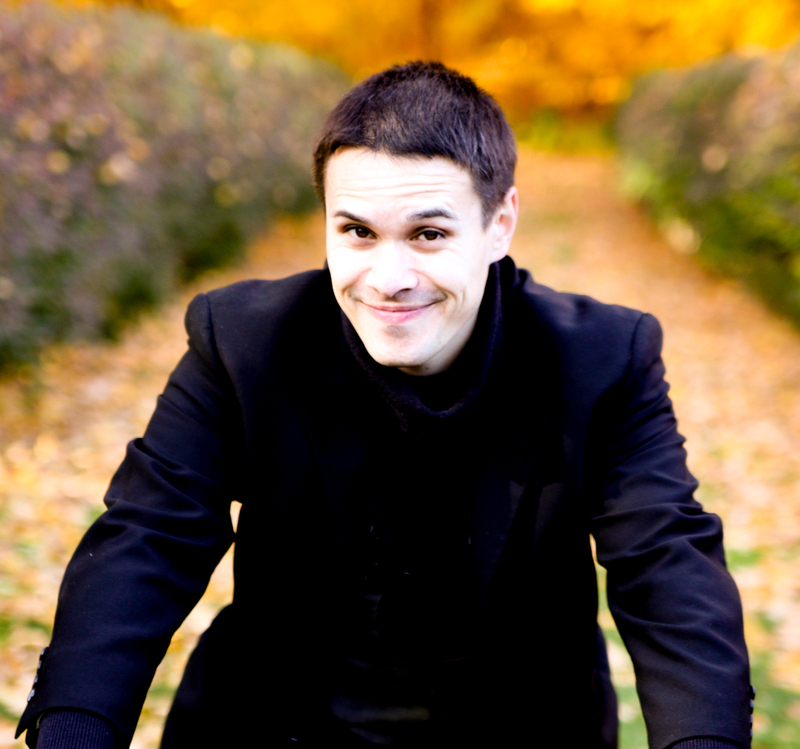 For the Minnesota Fringe Festival, he worked on the set and props for An Odyssey Backwards and in Heels, a musical update and twist on the classic Odyssey story from Greek mythology. Barnd spoke with the Arts Reader about his work and the dangers of being an elf in kindergarten. You’re listed as the technical consultant for An Odyssey Backwards and in Heels. What does that entail – what do you work on, when, etc? Joshua Barnd of River Bottom Productions. Photo by Annie Shurson/That Girl Mpls Photography. We do prop and set creation at the River Bottom Productions shop located in Jordan. I am creating some of the prop/set pieces for the show and also making recommendations for sound and lighting. As you know, technical elements are limited in the Fringe venues, so I am a bit limited in what we can do with the limited time frame and limited access to the space. How did you first get into theatre? When did you do your first professional first show in the Twin Cities? What was your capacity and what company was it with? My first theatre was probably as an elf in a holiday show in kindergarten…like so many others. My parents worked on sets and lights for Jordan Community Theater; my sister and I tagged along and helped out with painting and lighting when we were young. I was active in Drama all throughout my school years, and in college I had acting classes (taught by Peter Rothstein), then did a show under Rothstein and another show under Tom Darnell at St. John’s University. My first professional show was Hauntings with Hey City Stage in 1994 and 1995. My family did lobby decor for both the Wabasha Cave location and the 7 Corners location. Then, in ’95 I was at Hey City Theater for about 10 years, working on Tony ‘N Tina’s Wedding, Smokey Joe’s Cafe, Nunsense Amen, and Beehive at the Hennepin Ave location. While with Hey City, I was a bartender, understudy, house manager…and worked with the tech crew. I’ve been attending Fringe Shows since about 1998-1999. This, An Odyssey Backwards and in Heels is the first show that I have worked on in an official capacity. 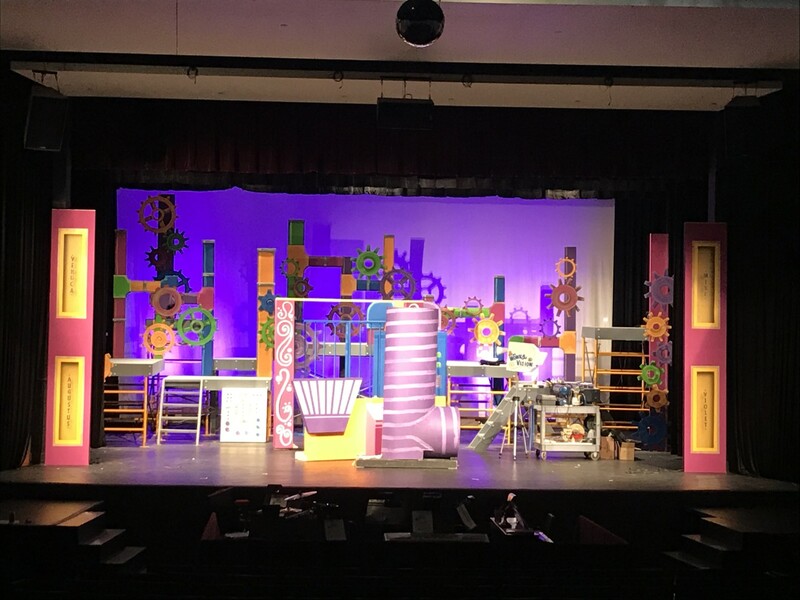 A set produced by River Bottom Productions for Willy Wonka at The International School of Minnesota. At what point did you decide to start your own production company? I started River Bottom Productions about 11 years ago. I had been a Middle School and High School Science teacher prior to that and had been directing (and continue to direct) High School Theater since 1999. The teaching became too much after some budget cuts and I decided to start the business. Your company River Bottom Productions is based out of Jordan, MN. Do you end up giving people directions involving Minnesota’s largest candy store? It’s hard to miss the “big yellow barn” 😉 But we do a lot of work at the Candy Store. We (River Bottom Productions) recently installed a new sound system throughout the building and lighting on the new Gotham-themed mural. We’ve created numerous props there and my sister, Jessica Barnd, has painted all the billboards, candy signs, and many of the murals inside the store. We also do a lot of work for the Haunt at Valley Fair/Valley Scare. We are in our 4th year designing, painting and propping the large mazes. What are the farthest places that your work with RBP has taken you? River Bottom Productions had done work in Bismark, ND and have rented and delivered various props to Wisconsin, Iowa, North Dakota and have also provided technical assistance for Edina High School for all 4 of their main stage shows at the International Thespian Festival in Lincoln, NE. 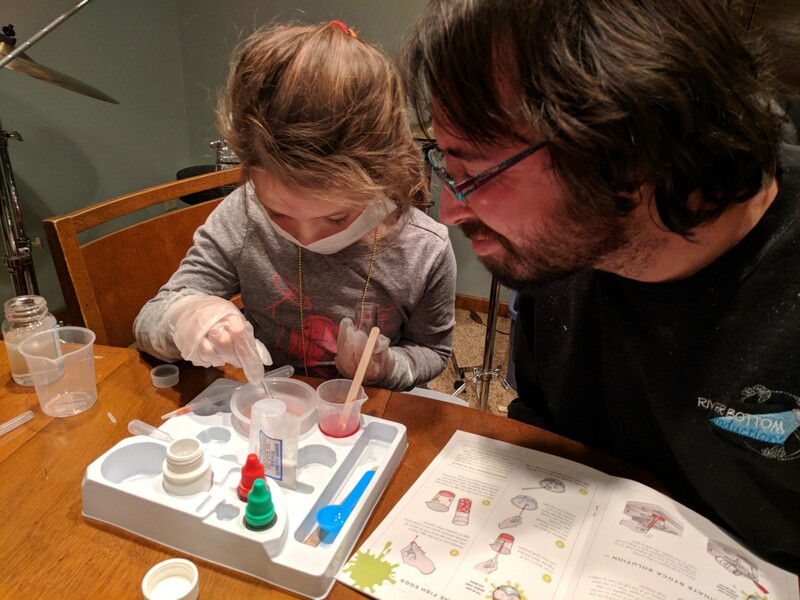 Joshua Barnd training an apprentice, his daughter Zoe, on scientific matters. How did you end up working this show? Anya approached me and asked if I could lend my expertise to the technical aspects of the show. I knew it would be a fun project to work on and enthusiastically got on board. Many theatre people do some odd jobs over the years – some onstage, some off. What’s one of your oddest ones? Ha! Well going immediately from dissecting cats in an Anatomy and Physiology class to play rehearsal is an interesting juxtaposition of duties Many things that we consider “normal” other would find pretty odd. We have done some pretty interesting props throughout the years and many times there is no manual to refer to. River Bottom Productions has some concerts to tech in late Summer and early Fall and we have a few shows in the Fall that we will be working on: James and The Giant Peach at Jordan High School (Technical Director), Into the Woods at Irondale High School (Technical Director), Little Shop of Horrors at Brillion High School (WI; it’s a plant prop rental), and Drowsy Chaperone at Edina High School (sound technician) are all on the calendar. We also have a handful of weddings to DJ at in August and September, and we have a new Haunt maze to complete for Valley Fair. There’s always something we are creating! 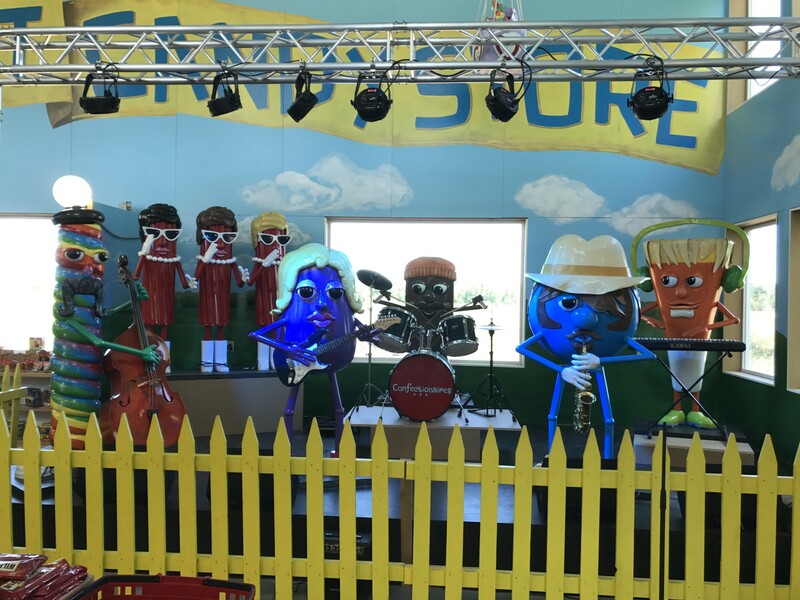 A mural at Minnesota’s Largest Candy Store lit by River Bottom Productions.